F-35 committee probe stalled, shutting down soon? 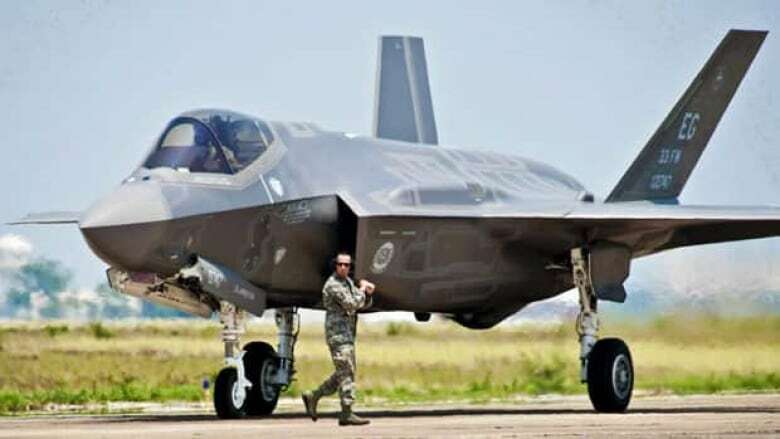 Opposition MPs on the public accounts committee are accusing the government of having something to hide, based on a secret Conservative motion to stop hearing witnesses on the controversial F-35 fighter jet procurement. Opposition MPs are asking whether the government has something to hide, after a Conservative motion to wrap up the public accounts committee's investigation into the controversial F-35 fighter jets purchase. The motion, introduced during a closed-door meeting of the Commons public accounts committee, would ensure the committee proceeded to write its report without hearing from any more witnesses. "We'll do everything that we can to prevent it," Liberal MP Gerry Byrne told CBC News. "This is too substantive, this is too important... these are issues that need to be in the public domain." During question period on both Monday and Tuesday, opposition MPs asked why the government wanted to stop the committee from getting to the bottom of the controversy. "We have heard from the auditor general not once, not twice, but three times. We have heard from departmental officials not once but twice," Andrew Saxton, the parliamentary secretary to the president of the treasury board, told the House of Commons Monday. "It is time to get on with writing the report." Saxton's Monday Commons statement, the essence of which he repeated on Tuesday, was the first public indication that the committee's work may be nearly over. MPs are not supposed to discuss in-camera committee proceedings in public, although Byrne has begun to do so out of frustration with the government's now-frequent moves to remove House committee meetings from the public and the media's gaze. The committee's study followed the auditor general's report on the cost discrepancies surrounding the procurement process for the fighter jets. Michael Ferguson said that Parliament didn't get complete figures on the cost of the F-35 purchase, which the auditor general's report suggested could be nearly $10 billion higher than the $16 billion the Harper government had disclosed, and defended when challenged by the Parliamentary budget officer and others during the 2011 federal election. The F-35 purchase is necessary, the government says, to replace Canada's aging fleet of CF-18s. New Democrat and Liberal MPs suggested long lists of witnesses they wanted to hear from as part of the committee's investigation. But the committee never agreed to hear from witnesses beyond the auditor general, the Parliamentary budget officer, and several of the senior departmental officials involved in the procurement. Conservatives hold the majority of seats, and votes, on the public accounts committee. Byrne said after Tuesday's closed-door meeting that he's asked the chair of the committee, New Democrat David Christopherson, to review whether an opposition motion to hear from specific witnesses, made in public like his, should be sidelined in favour of considering a government motion, moved in private, to shut the hearings down. Christopherson rose during question period on Tuesday to speak to Byrne's concerns, saying the Liberal MP's motion was out of order but that he is reviewing his decision as requested and will report back to the committee at its next meeting on Thursday. "The government is specifically blocking ministers from appearing before us," Byrne told CBC News. "What exactly does this government have to hide? "The auditor general said he felt decision makers weren't informed properly. I'd like to talk to those cabinet ministers about that very issue," New Democrat Malcolm Allen told CBC. "They clearly have decided that they don't want to hear from those witnesses," Allen said. At a news conference in Ottawa Tuesday on another matter, Defence Minister Peter MacKay was asked about the government's apparent efforts to shut the committee's investigation down. MacKay noted that he'd appeared before the committee for "something like seven hours on subject matter that would include the F-35." "I think we've made ourselves available," MacKay said, adding that he doesn't interfere with the work of Commons committees. "They make decisions for themselves, and as the saying goes, we'll let them do their work." "Canadians need to understand what happened on the F-35 file," Allen said. "In this particular case [the Conservatives are] trying to protect themselves."